Most bike repairs can be done with regular tools that you can find at the hardware store. Some however are very specialized and specific to certain tasks. For example the chain breaker tool or the pedal crank puller are pretty specific items that any starting mechanic should get. Tools are not cheap and one source that might get you a bargain are the omni present flea markets and garage sales. Used tools, of any kind, are sometimes of better quality than the newer items and the price is often very decent. 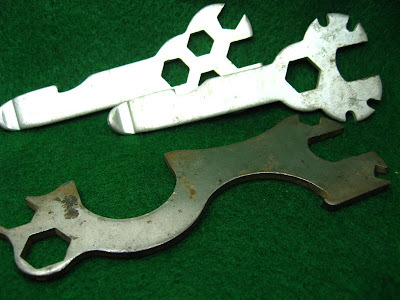 The examples in the picture above are mostly meant for carrying in a saddle bag but I would be confident in using that 50's era tool that is at the bottom of the pic. That tool has everything I need to take apart an old style three piece bottom bracket and cotter pin cranks. The others I grabbed because I collect old bike stuff and I found that the tire spoon part could be practical. I got the whole lot for $6. Yes $2 a piece! Buying all the tools separately to take apart that bottom bracket new would cost over $60 easy. Keep an eye open for old and used tools at flea markets and garage sales. Look up online for images of bike tools so you know what you are looking for. Chances are the person selling it doesn't know what they have and the price should be more than decent. That is one of the best way to get your hands on cheap bicycle tools.